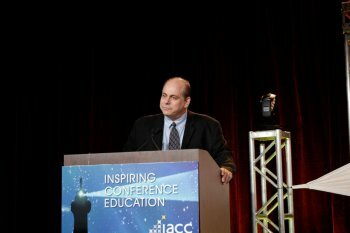 (NEW YORK, NY) – April 1, 2013 – IACC-Americas has announced that Neil Pompan, CMP, President of Pompan Hospitality Global, is the recipient of the coveted Mel Hosansky Award for Distinguished Service, IACC-Americas’ highest and most prestigious honour. TJ Fimmano, President of IACC-Americas (and General Manager, Dolce Hotels & Resorts at GE Crotonville), presented the award at the association’s 32nd annual conference. In presenting the award, Fimmano cited Neil’s 20 years of experience and commitment to the conference centre segment and his active participation in development and operations of numerous IACC-member properties. Neil served on the Board of Directors of IACC-Americas and was Chair of the Annual Conference Planning Committee. He also served on the Education Committee and helped created the IACC Scholarship program for the Americas. He held various posts on the Americas Board of Directors for an incredible ten years, including President of IACC-Americas. During his term as president, the Thought Leader and the Board Associate programs were born, the sustainability committee and the Design for great Technology were created. In 2001, Neil received an Award of Excellence and in 2004, he was the recipient of IACC’s highest educational honor, the Pyramid Award. He went on to serve as Global President in 2010 through 2012 and was instrumental in working with members in France, UK, Germany, Netherlands, Sweden, Denmark, Belgium, and Spain to bring them into one unified Chapter, IACC-Europe. As President of Pompan Hospitality Global, a hospitality consulting firm that supports the business objectives of developers, owners, asset managers, independent and brand operators and meeting professionals around the world, Neil is recognized for his passion and leadership and for challenging the status quo while serving as the highest example of integrity. Beginning in 1985, IACC has annually acknowledged one individual who has given the most to IACC and the conference centre industry. Originally called the Distinguished Service Award, it was renamed in 1990 in memory of its first recipient, Mel Hosansky, who died later that year. A long-time editor of Meetings & Conventions Magazine and later Successful Meetings. Hosansky was an early supporter of IACC and its objectives. Founded in 1981, the International Association of Conference Centres is a not-for-profit organization dedicated to promoting understanding and awareness of the conference center industry and to giving member properties the tools necessary to provide an exceptional meeting experience. Active members meet a set of stringent Universal Criteria and agree to a Code of Ethics. Currently, the association includes approximately 400 members from the United States, Australia, Canada, Denmark, Sweden, Belgium, France, England, The Netherlands, Germany and Japan. For more information, visit the website at www.iacconline.org. “There are meetings and then there are IACC meetings."